More than 100 million years ago, on a muddy stretch of land that is now Australia, nearly two-dozen species of dinosaur once roamed. There were duck-billed ornithopods, which left long, three-toed tracks in their wake. Heavy armored dinosaurs pressed large, tulip-shaped prints into the soil. Predators scratched the ground with their talons. And the feet of gigantic, long-necked sauropods created bathtub-sized depressions in the dirt. Asteroids struck, continents moved, sea levels rose and fell. What was once a damp, forested environment surrounded by shallow seas became the hot, rugged coastline of northwestern Australia. But the dinosaurs’ tracks remained. The footprint assemblage, which contains evidence of 21 species, is the most diverse in the world, researchers reported Friday in the Journal of Vertebrate Paleontology. One of those tracks is the largest dinosaur print ever recorded: a 5-foot-9-inch print from a sauropod, or long-necked dinosaur. The tracks also provide the first evidence that spiky tailed stegosaurs lived in the land down under. The Goolarabooloo have known about the fossil trackways for millennia. The massive markings, which are visible only at low tide, are featured in Goolarabooloo oral histories, or “song cycles,” Salisbury told the BBC. “They relate to a creation mythology, and specifically the tracks show the journey of a creation being called Marala — the emu man. Wherever he went he left behind three-toed tracks that now we recognize as the tracks of meat-eating dinosaurs,” he said. Working alongside the Goolarabooloo, who are considered the region’s “traditional custodians,” Salisbury and his colleagues spent 400 hours investigating the markings. Each one was measured with three-dimensional photogrammetry, a technique used to build a 3-D reconstruction of an object by taking photographs from a variety of angles. For some tracks, the scientists also made casts out of flexible silicon, which can later be used to produce museum replicas of the prints. According to Salisbury, most other Australian dinosaur fossils come from the continent’s eastern side and date back to the mid-Cretaceous, about 90 to 115 million years ago. 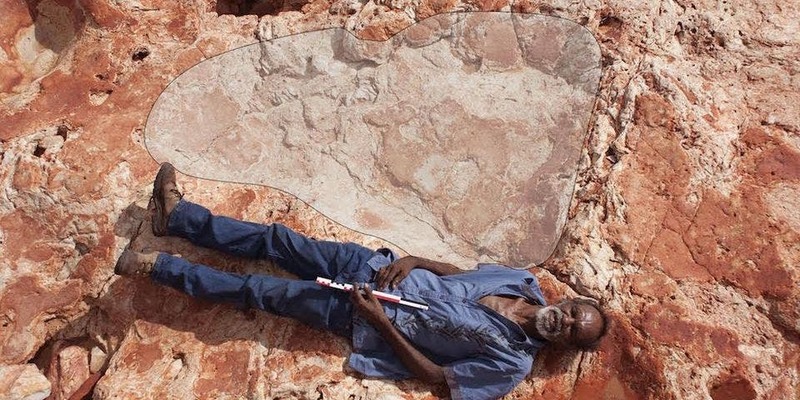 These tracks, which are between 127 and 144 million years old, represent the only fossil evidence from the early Cretaceous and are some of the oldest dinosaur remains in Australia, he said.